No post today. I’ve discovered this new game called Cookie Clicker. Have you heard of it? It’s fun. You click on a cookie. Each time you click the cookie, you get a cookie. You use the cookies to buy more things to click on the cookie for you, so that you can get even more cookies. I’m not quite sure why this has me so spellbound, but it does. I have a friend I’ve never met. Hey, uh, you mind if I share your seat with you? Bus is crowded this morning, and I’ve got, like, 30 stops until mine. Thanks. Sorry about the bag. What? No, I don’t have a phone charger. I usually charge mine at the office. Sorry. Oh, on my Facebook. Here, let me scroll back up – her? Yeah, she is kind of cute, I guess. It’s a weird story with her, though. I’ve never actually met her, or really talked to her at all. But we’re friends. That’s right! Not that the blog is moving, but I am moving, out in the real world! The physical world. The world outside the internet. I’m not moving far – just across town – but most of my stuff is currently stored away in boxes. I’ve got approximately 48 hours to move the contents of a two bedroom apartment, packed into the space of a one bedroom apartment, into a different apartment. I feel like I’ve been saying the word apartment too much. Apartment. A part mint. Like an entire building – but only part of it. I arrived at the brewery to find him already seated at a four-person table, his head buried in his hands. From the dent he’d managed to make in the oversized plate of nachos in front of him, I guessed that he’d been here for a while. “Hey, buddy – I didn’t realize that you got here early,” I remarked, patting him on the back as I stepped around to sit opposite him at the table. That’s right, it’s the new year! 2016, baby! And there’s going to be some changes around Missing Brains (here). First off, scheduling. Missing Brains, the blog, is sticking with a Monday, Wednesday, Friday schedule. Three posts a week! Monday: I’m going to be telling a serial story, called The Amateur’s Guide to the Apocalypse, in segments. I’ll post a new segment, about a thousand words per update, every Monday. Hopefully, the story will end at exactly 52,000 words. Wednesday: Wednesday will be a short story, with a theme focusing on real life. Friday: Friday will also have a short story update, but Friday’s theme will focus on the fantastic, science fiction or fantasy themed. Twitter: Missing Brains is going to have a twitter handle! Of course, it won’t be @MissingBrains, since that’s my personal handle – but maybe I’ll make @MissingBrainsBlog into a channel. I’ll hopefully attract a larger audience through Twitter. RSS: I don’t really know how RSS works, but I’m going to try and use it. New Website Design: In the works, probably not coming for a while. Patreon: This is a new thing – when I’m not writing, I’m a graduate student. Notably, neither graduate students nor writers make much money. That’s why I’m going to see about setting up a Patreon, so that readers (you) can fund writers (me! ), to help me afford to keep on writing! I’ve never set one of these up before, so we’ll see how it works out. Can I keep this up? Will my well of inspiration run dry? We’ll find out – together! My latest novel is LIVE and for sale – for just 99 cents! Hey there, reader! Do you like stories with comedy, drama, angels, sassy female heroines, and the end of the world? What am I saying, of course you do. Who in the world wouldn’t like such an amazing sounding story? Well, now you can read the very story I described above, all for just 99 cents! And you know that it will be good, because I wrote it! Check out my latest book, Apocalypse Before Coffee, by clicking the picture of my book above! It’s for sale on Amazon, and it’s only 99 cents, or free to borrow and read if you’re a Kindle Unlimited subscriber! Seriously, give it a look. It includes a plucky female heroine, a rather sarcastic angelic guardian, sneaking into Hell via the back entrance (located in the DMV), multiple celestial beings getting pepper-sprayed (it’s nothing they don’t deserve), people nearly vomiting from inter-planar travel, a climactic showdown for the fate of the entire Earth, and spiky demonic toilets. And if that doesn’t describe the perfect novel, well, I don’t know what you want. Another National Novel Writing Month challenge bites the dust! That’s right, I just passed 50,000 words on my latest novel! And all of it done in under 30 days, with an average of approximately 2,300 words per day. Not bad at all! Of course, the novel’s not done yet. 50,000 words is a good start, but I’ve probably got 10k more to go before the story’s wrapped up. "Danni California" is now available as an ebook! It’s the end of the nineteenth century in a growing nation, and unrest is close at hand. Jasper might wear the high collar of a priest, but he’s a trained killer, highly paid to assassinate anyone troubling the shadowy Organization. He’s just received his latest target: a young female redhead robbing banks from Mississippi to Illinois. But as Jasper hunts his flame-haired mark, he finds himself growing closer to her. Danni is smart, sassy, and sensual—even when Jasper’s looking down the barrel of her Colt. As fate pulls the robber and the assassin closer together, they find comfort in each other’s arms. But can these two outlaws hope to stand together as the nation’s forces rally against them? That’s right! The story I’ve been telling on here for 25+ posts is now its own ebook, available for purchase on Amazon.com! And it’s less than a dollar! So, want to support your local, organic, GMO-free, whole grain blogger? Pick up a copy by clicking the link above! A true flight saga, told through tweets. On a late night flight, I’m being distracted from a very loud baby by watching my seat mate attempt to understand the wifi. He doesn’t realize it isn’t free. He’s watching TV on his phone. Heroes – one of the earlier episodes. It’s buffered a bit. I’m waiting. It’s hit the end of the buffer. First step, check to make sure wifi is on. It is. Let’s wait. We’re holding our breath. Surprise, no buffer. Because he hasn't paid for wifi. Okay, let's try reloading the app. Interestingly, the app loads – but none of the videos. It must display titles offline. Five reloads has not brought back Heroes. Damn you NBC. Okay, let's try reloading the wifi. Sure enough, the signal is very strong. We have reconnection! App still isn't working. Even reloading it 5 more times hasn't helped. I've pulled out the wifi card from my seat back pocket in an attempt to help the poor fellow. He looks to be giving up and switching to music. Wait – success! He has discovered the card about wifi access in flight! The card has not been helpful. The saga is interrupted by the arrival of the drinks trolley. Apple juice, please. App still isn't working, even with some Coke providing a caffeine burst for his brain. Should I tell him? I feel conflicted. I'll consider this as I sip my delicious apple juice. Tastes like schadenfreude. My Spotify works great. Because I have loaded the playlist offline. Muahaha. I've decided that I will tell him – if he asks me. Coke is gone. So long, empty apple juice cup. Google maps! This is something new! Google maps is stuck on “loading”. Because it cannot access the phone. Oh no. He took the blank GMaps as a good sign and has tried the TV app again. No luck, my dear companion. The flight attendants have left the cabin lights on, which hinders both my ability to sleep and my ability to spy on my seat mate. He has discovered that the wifi is, indeed, not free. He looks dismayed. Fortunately, we are now descending towards our landing. It took him almost an hour, but I'm proud of him for figuring out on his own. We have now landed, and I can tweet this. Because I also did not pay for wifi. I bite my thumb at you, #gogoinflight. A culinary ode to Sir Terry Pratchett: Meat Pie Floaters! An avid reader of the late, great Sir Terry Pratchett’s Discworld novels should recognize the term “meat pie floater.” This culinary delicacy (that is, something so disgusting that none of the locals will eat it) comes from the mysterious continent of FourEcks, which certainly isn’t modeled after Australia at all. Rincewind looked down at the knobbly green surface. Was it just possible that someone had invented a regional specialty you could eat? And then something rose out of the depths. For a moment Rincewind thought it was a very small shark. 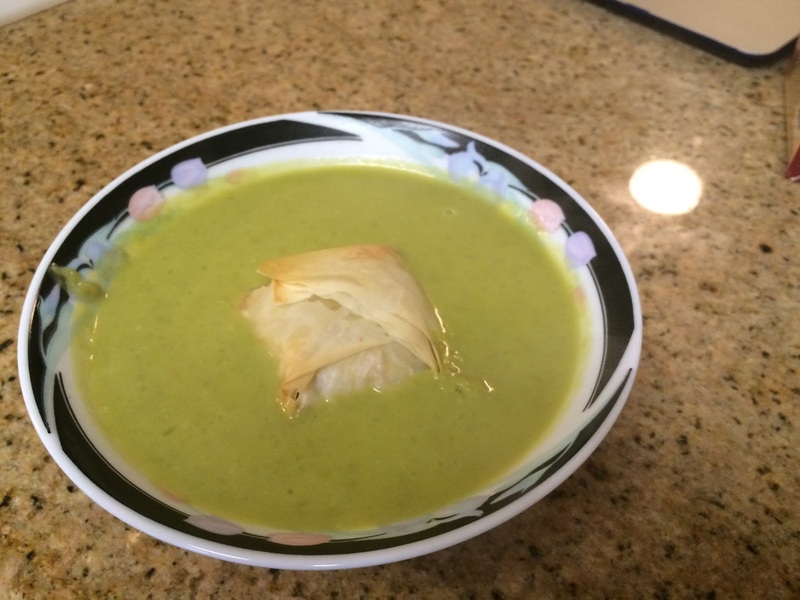 It bobbed to the surface and then settled back down, while the soup slopped over it. Mmm. Sounds absolutely delicious, doesn’t it? Well, I thought so. So I set out to make one! Spices; I went with seasoned salt and some pepper. Other various vegetables. I tossed in some white onion, garlic, and green bell pepper. Chicken stock, four cups’ worth. Not pictured: Sriracha. That soup needs a kick! Also not pictured: heavy cream. Half & half works too. It cuts the heat of the soup. Pre-heat the oven to 400 degrees Fahrenheit (205 degrees Celsius). I started by dicing up about a quarter of a package of mincemeat and threw it in a large saucepan on the stove, along with some water. I mashed it up with a spatula to break up the larger chunks. 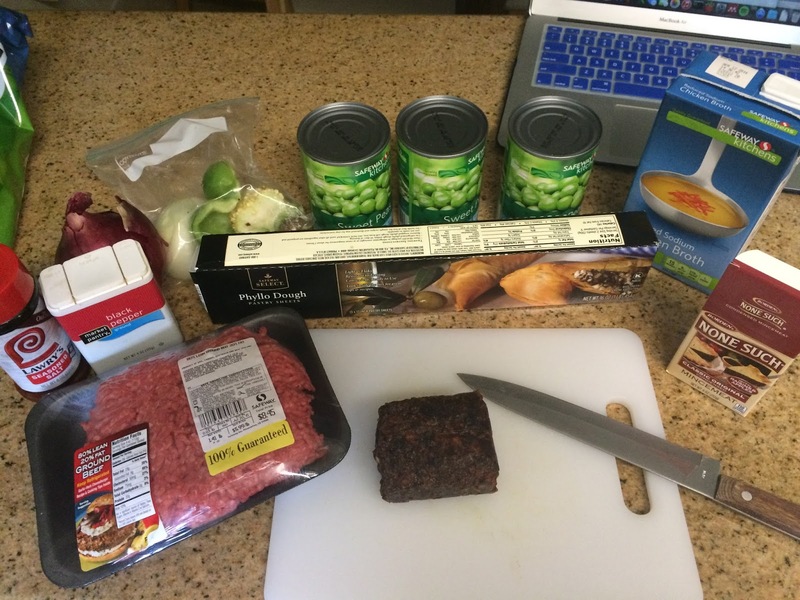 Next up: ground beef. Throw it into the same saucepan and cook it until browned. Taste and season until you can taste salt as well as sweet. Mincemeat is mighty sweet so it may take a good bit of salt. Take it off the stove and let it cool once the meat is cooked. 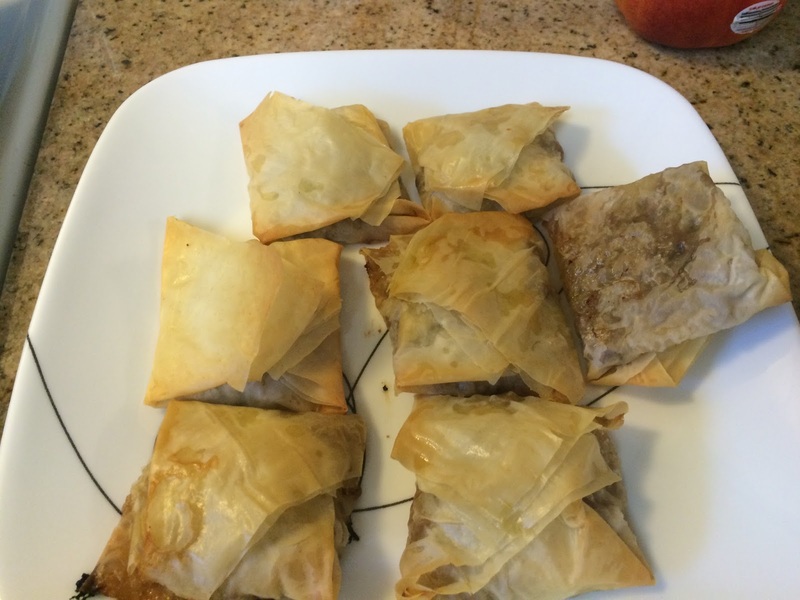 Next, roll out your phyllo dough. This stuff comes in a whole bunch of thin layers and is fragile stuff, so be careful. Cut the dough into squares, four or five inches on a side. They don’t need to be perfect. Brush the corners of each square with olive oil, put a spoonful of the cooled meat mixture in the middle, and then fold the dough up around the meat to make a little package. Use more olive oil to seal it shut. It will probably take 3-4 layers of dough per floater to keep things from breaking apart. 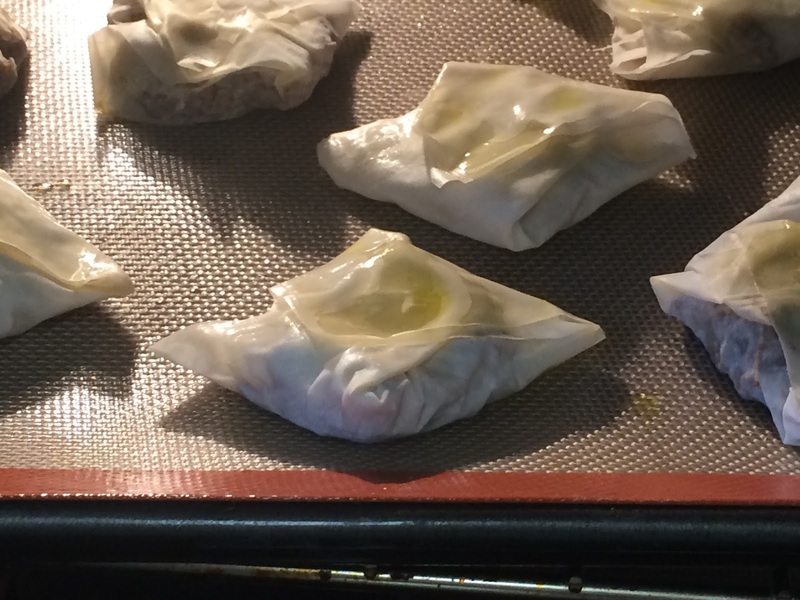 Place the folded little floaters on a nonstick baking sheet and brush them with some more olive oil. Put them in the oven for ~15 minutes. Grab a pot. A big one. Should hold at least six quarts. 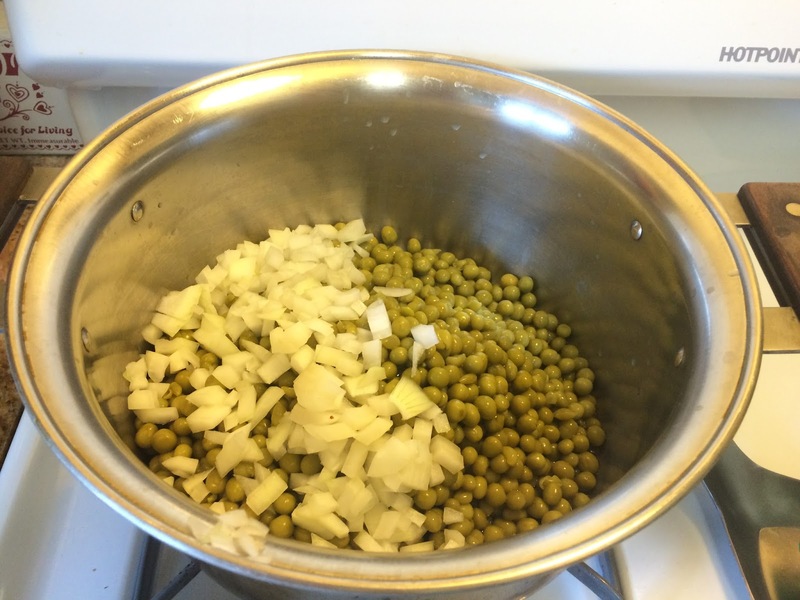 Add your peas, four cups of chicken stock, and all your diced vegetables. There should be just enough liquid to cover all the vegetables. Throw in a squirt of Sriracha. Bring this all up to a boil, and boil for about a minute or so. Carefully, use a stick blender to blend the whole soup up until it’s fairly smooth. This shouldn’t take long. Watch for splatters! Once the soup is blended, add a 1/2 cup of heavy cream (or half & half). Stir this in. Taste the soup and decide how much more Sriracha it needs for some heat. Add it. Place a couple meat pie bites in a bowl, cover them with soup, and watch as they rise up to the surface! They’re actually super tasty – the sweetness of the meat pie helps cut the heat of the soup. Add a little dollop of tomato sauce on top if you want the true authentic FourEcks Dibbler Experience.